Back at the end of March, Gauthier suggested that we "invite" our dolphin friends to join us in Dingle during the conference. He proposed that we should meditate every Friday evening at 9pm and send them a telepathic message that they were also welcome to come. I'm not very good at telepathy myself and to be honest I forgot every time Friday came round anyway. Gauthier did not, however and he was assisted by Frederique and Ute.... and guess what happened??! Of course, Fungie is always in Dingle. But as the weekend before the conference approached and people started arriving, suddenly my phone was ringing and there were dolphin sightings all around: several times in Ventry (where Gauthier and friends had booked a cottage overlooking the harbour! ), at Cuan and then at the mouth of Dingle harbour, where one day 6 or 7 were reported, one day 3 or 4. By Sunday May 11th, when we had moved into the conference suite a large stone frieze of four leaping dolphins carved by local artist Antonio Fazio, it was clear that including Fungie there were indeed exactly four dolphins hanging out at the mouth of the harbour. Some 20 of us sat on the headland at Slaidin and watched them cruising around in the afternoon sunshine. It's not by any means unheard of for Fungie to receive visitors, although it happens more typically in the winter... but it IS unheard of for three such wild dolphins to stay for four days, to be seen every day and for them to not be scared away by the inevitable attention from both commercial and pleasure boats! A group of our delegates even went out on a boat one evening and had all four dolphins leaping around the boat and even fishing together with Fungie (another first!). During the three days of the conference, then, we had the dolphins with us all the time within 1km of where we were sitting. On Thursday the main conference sessions were over, the four-dolphin frieze had been returned to Kilvickadownig and many of us went out on a boat trip around the Blasket Islands, where we saw large numbers of both bottlenose and common dolphins (and grey seals and a basking shark..). The same day, dolphins were reported all along the coastline of Dingle Bay, from Doonsheane to Ventry to Clogher, meaning that there were more dolphins in the area than we have previously recorded at any one time. A few of our number stayed behind in Dingle for a last look at Fungie before heading for the airport and they had the biggest surprise of all. 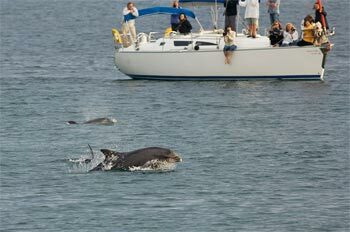 Two separate groups of dolphins came into the harbour, one of about 6-8 and the other maybe 12-14. They swam right past the inner channel marker buoys, where Fungie never ventures, and explored the inner harbour, with the larger group luckily unnoticed by the dolphin boats (who would otherwise surely have driven them onto the sandbanks and mudflats). The boats did give chase in typical reckless fashion to the smaller group but they managed to escape and all 20 dolphins were reunited in the outer harbour before they left. The next day, Friday, the weather continued warm and settled as it had been all week, but all the conference delegates had left Dingle, either to return home or to head up to Co.Clare to see Dusty. Not a single dolphin (apart from Fungie) was sighted anywhere along the peninsula, to the best of my knowledge. Nor were there any reports during the following three days of fine weather, and on the 20th the weather finally broke before I left Dingle on the 21st. Coincidence, synchronicity or interspecies communication?! You decide!